Its name derives from the Dutch word "koekje" which means little cake, and arrived in the English language via the Scots language, rather than directly from the Dutch. In Scottish English the word denotes a small scone-like cake or bun, often filled with cream. Cookies were first made from little pieces of cake batter that were cooked separately in order to test oven temperature. The ancestor of the cookie is said to have come from Persia (from the Persian kooluchih) in the 7th century according to many sources. 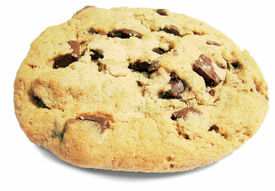 Cookies can be baked until crisp or just long enough that they remain soft, depending on the type of cookie. Some cookies are not cooked at all. Cookies are made in a wide variety of styles, using an array of ingredients including sugars, spices, chocolate, butter, peanut butter, nuts or dried fruits. A general theory of cookies may be formulated this way. Despite their descent from cakes and other sweetened breads, the cookie in almost all its forms has abandoned water as a medium for cohesion. Water in cakes serves to make the base (in the case of cakes called 'batter') as thin as possible, which allows the bubbles – responsible for a cake's fluffiness – to form better. In the cookie the agent of cohesion has become some variation of the theme of oil. Oils, be they in the form of butter, egg yolks, vegetable oils or lard are much more viscous than water and evaporate freely at a much higher temperature than water. Thus a cake made with butter or eggs instead of water is far denser after removal from the oven. Oils in baked cakes do not behave as water in the finished product. Rather than evaporating and thickening the mixture, they remain, saturating the bubbles of escaped gasses from what little water there might have been in the eggs, if added, and the carbon dioxide released by heating the baking powder. This saturation produces the most texturally attractive feature of the cookie, and indeed all fried foods: crispness saturated with moisture (namely oil) that does not sink into it. Obviously there is some variation in that some cookies are purposely undercooked to retain a water-moist center. Also of course there are many types of cookies and so not all are made in the same manner. Bar cookies consist of batter or other ingredients that are poured or pressed into a pan (sometimes in multiple layers), and cut into cookie-sized pieces after baking. Brownies are an example of a batter-type bar cookie, while Rice Krispie treats are a bar cookie that doesn't require baking, perhaps similar to a cereal bar. 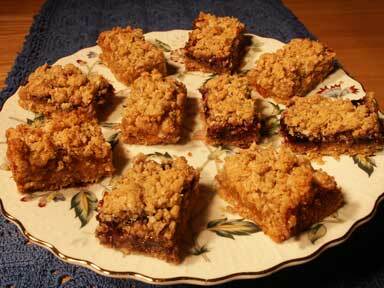 In British English, bar cookies are known as "tray bakes". A cake is a form of food, usually sweet, often baked. Cakes normally combine some kind of wheat by product, a sweetening agent (commonly sugar), a binding agent (generally egg, though gluten or starch are often used by vegetarians and vegans), fats (usually butter or margarine, although a fruit puree can be substituted to avoid using fat), a liquid (milk, water or fruit juice), flavours and some form of leavening agent (such as yeast or baking powder). Cake is often the dessert of choice for meals at ceremonial occasions, particularly weddings or birthday parties. In some traditions the bride and bridegroom are the first to eat their wedding cake, often serving each other a piece in their fingers. For birthdays, a frosted (iced) cake, often with inscriptions in frosting and figural decorations, is covered with candles, which are blown out after the celebrant makes a wish. 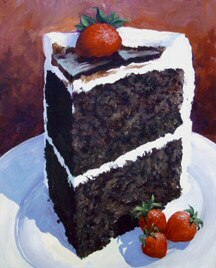 Cake is considered delicious in many cultures. A crumble is a dish of typically British origin containing stewed fruit topped with a crumbly mixture of fat, flour, and sugar. The crumble is baked in an oven until the topping is crisp. It is often served with custard, cream or ice cream as a hearty, warm close to a meal. Popular fruits used in crumbles include apple, blackberry, peach, rhubarb, and plum. Sometimes sour milk (vinegar and milk) is added to give the crumble a more extravagant taste. Also, brown sugar is often sprinkled over the crumble topping. A similar dish, without sugar, can be made with a filling of minced beef or lamb. Custard is a family of preparations based on milk and eggs, thickened with heat. 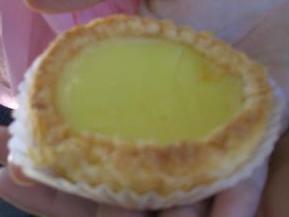 Most commonly, it refers to a dessert or dessert sauce, but custard bases are also used for quiches and other savoury foods. As a dessert, it is made from a combination of milk or cream, egg yolks, sugar, and flavourings such as vanilla. Sometimes flour, corn starch, or gelatin are also added. In French cookery, custard—confusingly called just crème—is never thickened in this way: when starch is added, it is pastry cream crème pâtissière; when gelatin is added, it is crème anglaise collée. Depending on how much egg or thickener is used, custard may vary in consistency from a thin pouring sauce (crème anglaise), to a thick blancmange like that used for vanilla slice or the pastry cream used to fill éclairs. 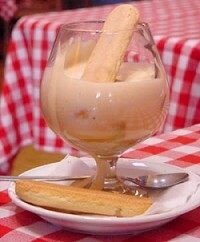 Custard is an important part of dessert recipes from many countries, including the United Kingdom, France, Portugal, Spain, Italy, and Australia. Instant and ready-made 'custards' are also marketed, though they are not true custards if they are not thickened with egg. Custard thickened with starch is a non-Newtonian fluid which in short means that if impacted with sufficient force it behaves more like a solid than a liquid. For a basic dessert custard, whisk 1/4 cup sugar with 4 egg yolks until pale yellow and thick enough to form a slowly dissolving ribbon when lifted. Then add 1 1/2 cups cream that has been brought to a boil, very slowly and mixing continually. Set over moderate heat (no more than 75 degrees Celsius), and stir continually until it thickens. 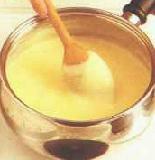 Most custard is cooked in a double boiler (bain-marie) or heated very gently on the stove in a saucepan, but custard can also be steamed or baked in the oven with or without a hot water bath. By far the most popular use for gelatin products is as gelatin dessert. In the United Kingdom, Australia and South Africa gelatin desserts are referred to as jelly, and in the United States and Canada (where "jelly" is a clear preserve stiffened by pectin and spread on bread) by its trademarked name, Jell-O. 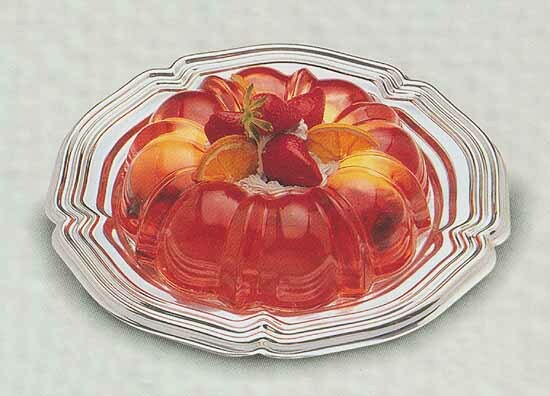 Gelatin for desserts is marketed as a flavored powder and sometimes in the form of loosely attached cubes, resembling a wobbly block. Popular brands include Jell-O from Kraft Foods in North America, Rowntree's Jelly in the United Kingdom and Aeroplane Jelly in Australia. Ice cream (originally iced cream) is a frozen dessert made from dairy products such as cream (or substituted ingredients), combined with flavourings and sweeteners. This mixture is cooled while stirring to prevent large ice crystals from forming. Although the term "ice cream" is sometimes used to mean frozen desserts and snacks in general, it is usually reserved for frozen desserts and snacks made with a high percentage of milk fat. 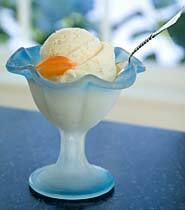 Frozen custard, ice milk, sorbet and other similar products are often also called ice cream. Governments often regulate the use of these terms based on quantities of ingredients. Meringue is a type of dessert, originally from France, made from whipped egg whites and caster sugar. Some meringue recipes call for adding a binding agent such as cream of tartar. Meringues are often flavoured with a small amount of essence, e.g., almond or coconut. They are very light and airy and extremely sweet. It is believed that Meringue was invented in the Swiss town of Meiringen by an Italian chef named Gasparini (legend varies in regard to the date of invention, between 1600 and 1720). Meringues used like cookies are baked at a very low heat for a long time - they are not supposed to be browned at all, but they need to be very crisp and dry. Cooked meringue cannot be refrigerated or it will become soggy. It will keep for at least a week in an airtight container. 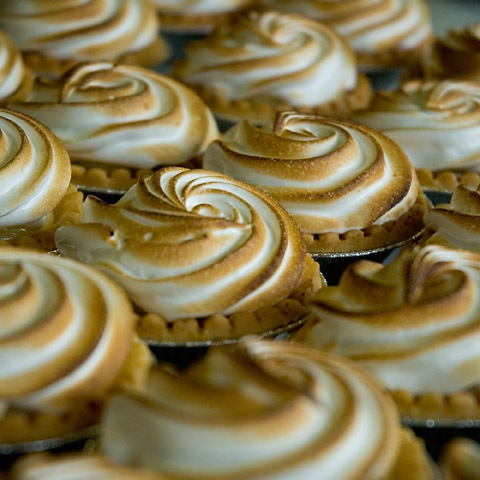 Meringue can be used as the basis for various other desserts including angel food cake, pavlova, baked Alaska, Queen of Puddings and lemon meringue pie. In these cases, the meringue may be cooked at a higher temperature for a shorter amount of time, resulting in a soft meringue with slightly browned peaks on top. Pastry is the name given to various kinds of dough made from ingredients such as flour, butter and eggs, that are rolled out thinly and used as the base for baked goods. 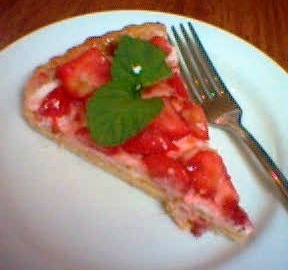 Common pastry dishes include pies, tarts, and quiches. A good pastry is light and airy, easily broken in the mouth (what is called 'short' eating), but firm enough to support the weight of the filling. The dough must be well mixed, but care must be taken not to overmix the pastry, which results in long gluten strands and toughens the pastry. Thus the manufacture of good pastry is something of a fine art. As pastry must be baked to be edible, and pie fillings often do not need extra baking, many pie recipes involve blind-baking the pastry before the filling is added. A pie is a baked dish, with a baked shell usually made of pastry that covers or completely contains a filling of meat, fish, vegetables, fruit, cheeses, creams, chocolate, custards, nuts, or other sweet or savoury ingredient. Pies can be either "one-crust," where the filling is placed in a dish and covered with a pastry/potato mash top before baking, or "two-crust," with the filling completely enclosed in the pastry shell. Some pies have only a bottom crust, generally if they have a sweet filling that does not require cooking. These bottom-crust-only pies may be known as tarts or tartlets. One example of a savoury bottom-crust-only pie is a quiche. Tarte Tatin is a one-crust fruit pie that is served upside-down, with the crust underneath. Blind-baking is used to develop a crust's crispiness, and keep it from becoming soggy under the burden of a very liquid filling. 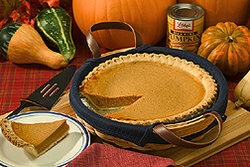 If the crust of the pie requires much more cooking than the chosen filling, it may also be blind-baked before the filling is added and then only briefly cooked or refrigerated. Pie fillings range in size from tiny bite-size party pies or small tartlets, to single-serve pies (e.g. a pasty) and larger pies baked in a dish and eaten by the slice. The type of pastry used depends on the filling. It may be either a butter-rich flaky or puff pastry, a sturdy shortcrust pastry, or, in the case of savoury pies, a hot water crust pastry. Pudding is either of two general types of food, the second deriving from the first. The older puddings were foods that were presented in a solid mass formed by the amalgamation of various ingredients with a binder, which might include batter (as in Yorkshire pudding), blood (black pudding), eggs (bread pudding), or a mixture of suet and flour or some other cereal (plum pudding). These kinds of puddings could be either baked, steamed, or boiled. This older type of pudding, still commonly made today in the British Isles, was often a main-course type of dish. Boiled puddings, in particular, were a common meal on board ships in the British Navy in the 18th and 19th centuries, and the usual manner in which daily rations of flour and suet were prepared. The Danish society Royale Danske Buddingentusiaster (Royal Danish Pudding Enthusiasts) was founded in 2005 and is organizing the promotion of the Danish type of pudding, i.e. using boiled milk, sugar and starch or gelatin as the base of flavours ranging from the classic vanilla and chocolate to the newer tequila and ginger. Sorbet (or sorbetto, sorbeto) is a frozen dessert made from iced fruit puree and other ingredients. The term "sherbet" is derived from the Turkish word for "sorbet", şerbat. Sorbets are traditionally served between the starter course and main entrée in order to cleanse the palate. The French are responsible for this culinary tradition. Folklore insists that Nero, the Roman Emperor, invented sorbet during the first century A.D. when he had runners along the Appian way pass buckets of snow hand over hand from the mountains to his banquet hall where it was then mixed with honey and wine. The Chinese have also made concoctions made from snow, juice, and fruit pulp for several thousand years. Frozen desserts are believed to have been brought to France in 1533 by Catherine de Medici when she left Italy to marry the Duke of Orleans, who later became Henry II of France. By the end of the 17th century, sorbet was served in the streets of Paris, and spread to England and the rest of Europe. Sorbet is served as a non-fat (sometimes 3% fat) and vegan alternative to ice cream. A soufflé is a light, fluffy baked dish made with egg yolks and beaten egg whites combined with various other ingredients and served as a main dish or sweetened as a dessert. The word soufflé is the past participle of the French verb souffler which means "to blow up" or more loosely "puff up" - an apt description of what happens to this combination of custard and egg whites. The base provides the flavor and the whites provide the "lift". 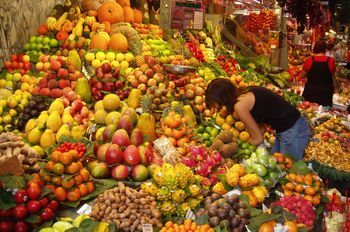 Common varieties include cheese, chocolate, and lemon (the last two made as desserts, with a good deal of sugar). Soufflé is considered a great delicacy. When it comes out of the oven, a soufflé is generally very large and fluffy, and will 'fall' after 20 or 30 minutes (as risen dough does). For best results, soufflé should be eaten quickly, while hot and before it falls. Soufflé can be made in containers of all shapes and sizes, but the best are tall cylindrical containers which conduct heat well. It is traditional to make souffle in "souffle cups" or ramekins.